Not to be confused with Professor Elvin Gadd's Lab, E. Gadd's main headquarters in Luigi's Mansion. The Lab in the Nintendo 3DS remake. 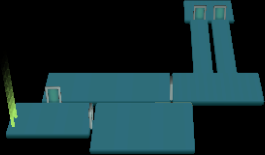 The Lab is a room of Professor Elvin Gadd's Lab in Luigi's Mansion. It is here that Professor E. Gadd informs Luigi about the mansion and its ghosts near the beginning of the game, and later provides information on Boos. This is also where E. Gadd asks the player where they want to go; to the Mansion, the Training Room, the Gallery, or, once the game is beaten, the Hidden Mansion. In the Nintendo 3DS remake, the camera has a different angle to fit with the screen and show the second player. Also, when E. Gadd asks Luigi for the first time what he wants to do, he receives a call from the future E. Gadd, who presents to him Gooigi, a copy of Luigi that can be used in co-op play. There is a tall, wooden ladder in the lab that can only be barely seen in-game. Through cheat codes, Luigi is able to actually climb the ladder up to the top through a tall, vertical tunnel, but the ladder doesn't lead to any in-game areas. This page was last edited on November 4, 2018, at 19:49.